Find the perfect jewel for your loved one in our line of red gold diamond engagement rings. BAUNAT works solely with the best quality materials, guarantees perfection and offers these high-quality diamond rings at the best prices. BAUNAT only uses the best materials: 18 carat gold (75% gold, alloy 'Au750') or Platinum 950 (95% platinum, alloy 'Pt950'). BAUNAT offers diamond rings in: white gold, platinum, yellow gold, red gold. Red gold is the most unique material you can choose when purchasing an engagement ring or a wedding band. It can be incorporated in several ways and a red gold ring lends itself perfectly to various precious stones. 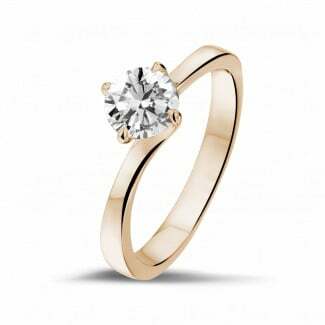 Among the bestselling combinations available on our website, are our red gold engagement rings, set with a solitaire diamond. Red gold rings stand out because of their quality and their accessible price point. The engagement ring is the principal symbol of a couple’s official union. Because of this, the ring has to correspond with the budget set beforehand by the soon-to-be-weds. By deciding on your maximum price point, it will be easier to find the best possible offer. BAUNAT makes it possible to find a ring that will meet all your demands, at a price accessible for anyone. 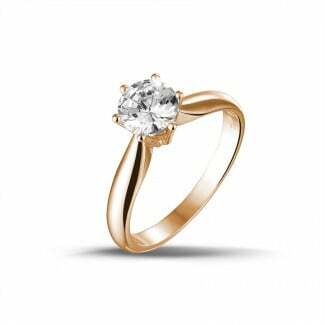 BAUNAT.com features an extensive collection of red gold engagement rings, to meet the individual needs and demands of all our customers. For example, a red gold trilogy ring, set with a central ruby and two diamonds on the side, or a red gold solitaire ring set with a pear-shaped diamonds. Also: a red gold flower rings, with an emerald and round diamonds. 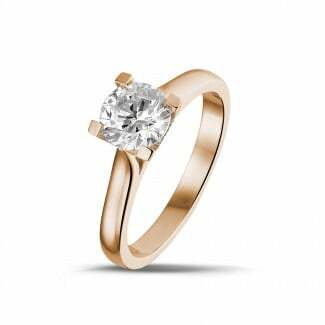 Engagement rings fashioned in red gold and set with diamonds are available in all shapes and sizes. 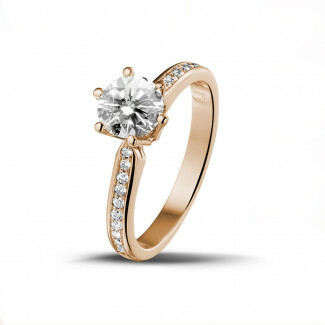 The engagement rings can be simple yet elegant, or ornate and luxurious, whichever you desire. A diamond is the stone most commonly used in an engagement ring, but other precious stones such as rubies, sapphires or emeralds are also a possibility. Small diamonds set in the ring band add the final brilliant touch. 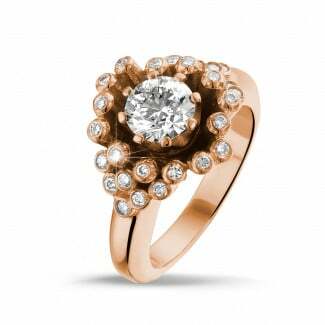 Visit our website to discover our extensive collection of red gold engagement rings.